Well, welcome to fall! It was supposed to be the first day of school here in British Columbia, but due to a labour dispute they are still closed and could be for an extended period. Very hard on everyone involved. It also poured with rain for the afternoon, so definitely a fall feel to the air. 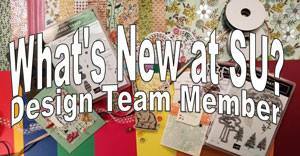 I am creating some designs for my Technique Night classes this week and the theme is the new Holiday Catalogue, so I have been trying to use a variety of different projects from the catalogue. 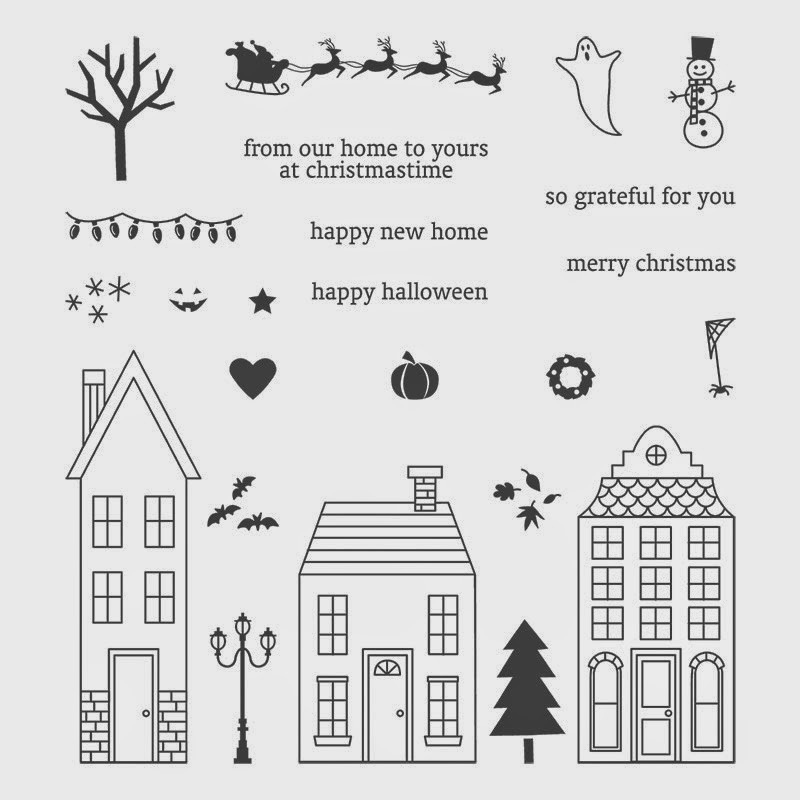 This was the first time I had inked up the new Holiday Homes Photopolymer stamp set and I had a lot of fun with it! 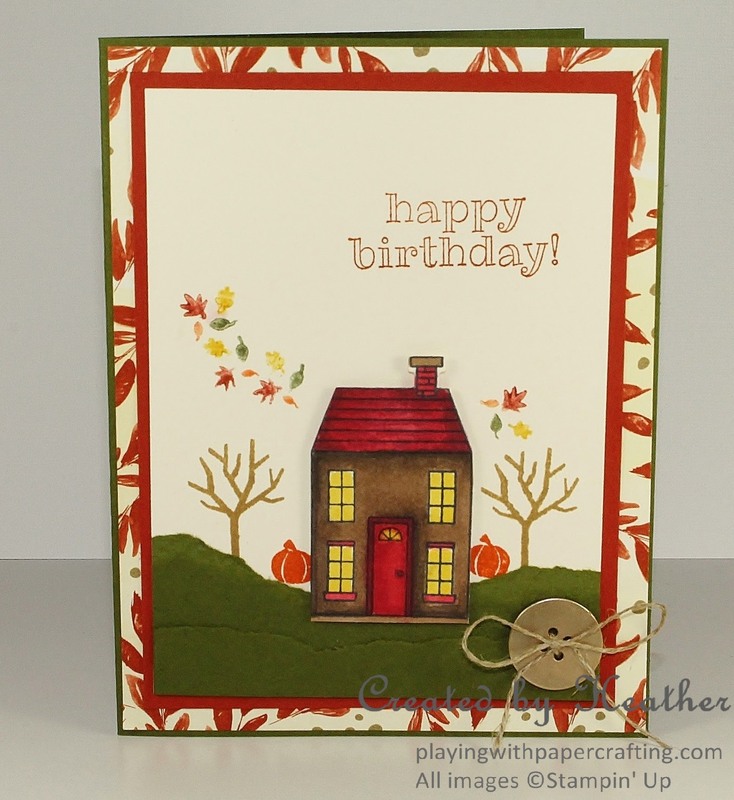 I used Mossy Meadow both as the card base and for the grassy ground in the picture. I ripped a couple of strips of Mossy Meadow cardstock and adhered it to the Very Vanilla panel to make hills, but before I actually glued it down, I used a couple of pencil dots to locate where I would stamp the other images. 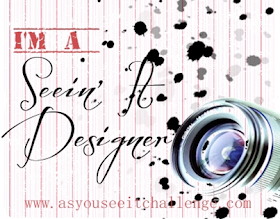 The background DSP is from the Colour Me Autumn collection. The trees in Baked Brown Sugar ink were placed on either side of where I wanted to locate the house. The pumpkins (Tangelo Twist) were as well. The house was stamped in Memento Tuxedo Black on a scrap piece of Very Vanilla. I then used Blendabilities markers to colour it in warm tones of Crumb Cake, Cherry Cobbler and Daffodil Delight. It was a wee bit tricky due to the small size of the image, but the small tips made it easier. It was then die cut with the coordinating Homemade Holiday Framelits and added to the panel using Stampin' Dimensionals to pop it up a bit. 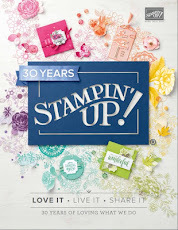 I stamped the little leaves stamp 4 times to look like leaves swirling in the wind. I used regular markers in Mossy Meadow, Tangelo Twist, Crushed Curry and Cajun Craze to colour them before each stamp. 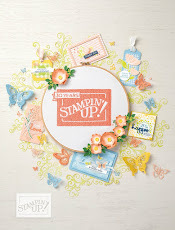 The sentiment is from So Very Happy and is stamped in Cajun Craze ink. 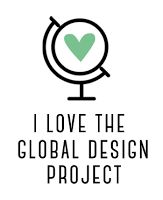 Love the new Gold Basic Metal buttons. It was very easy to thread the Linen thread through the holes and tie a small bow in it. This set is a very versatile one. It has little accessories from a wreath on the door, to bats flying overhead, a street light, a snowman and Santa's sleigh flying overhead. And because it's photopolymer, it is easy to see exactly where you're placing everything. This is a good value, and even better because you can bundle it with the Homemade Holiday Framelits and save 15%! 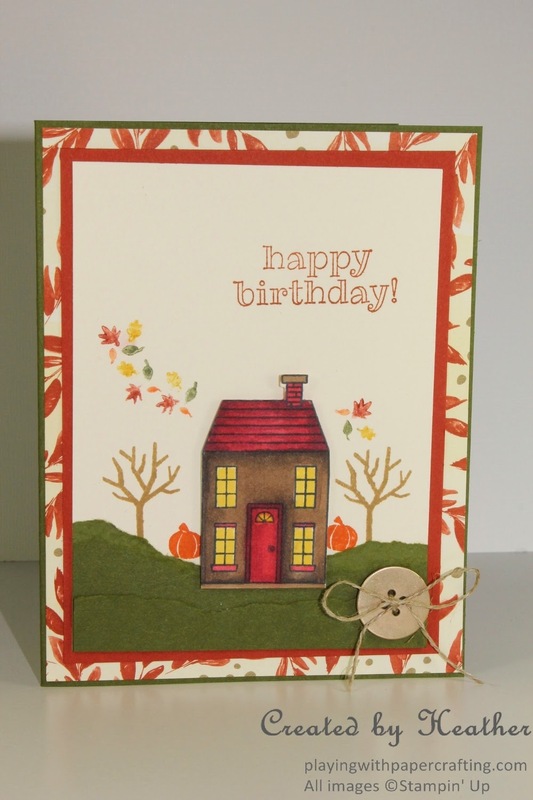 What a lovely fall-themed birthday card! I love how the leaves look as if they've been blown off the trees in the wind. 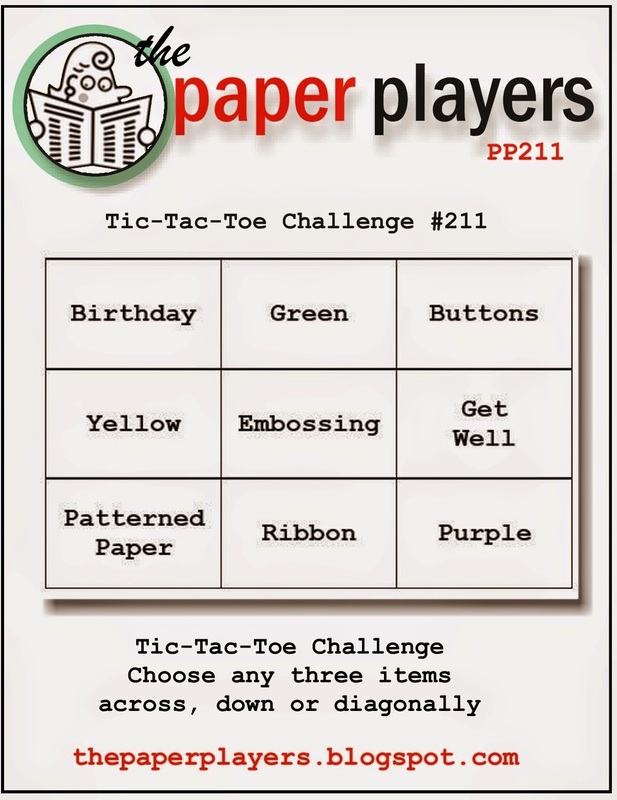 Thanks for playing along with the Tic Tac Toe challenge over at The Paper Players this week! Heather, this is so cute! I love all the little accents you've added to this card, but especially the gust of leaves. And the shading you did on the house is perfect! Thanks for playing with the Paper Players! Totally adorable, Heather! I love those swirling leaves...what a great idea! Great Blendy work on the house! Thanks for playing with The Paper Players! Congratulations on getting 'A Cut Above'. This is a really cute card, love it.